I’m back. Back from Turin, Italy this time. This summer has been one of more international travel than normal. I’ve got more to share from trips to France and Scotland later. Last week I spent three days in and around Turin. I had one afternoon off and spent it with the Cathedral of St. John the Baptist as my destination. After a subway ride and walk along the Via Roma I found the church. This is where the Shroud of Turin is kept. 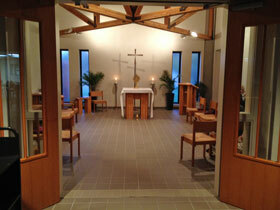 It is inside this container in a side chapel. Next year there will be an open exposition of the Shroud and there may be a possibility I can go. However, at this visit I was able to sit and pray for a while. I know how controversial this object is but I can’t help but get goosebumps just thinking about it much less being able to be this close to it. I’m adding this to the list of the blessings I’ve received to have as life experiences along my Path to Holiness. I don’t think I deserve them and I’ve still got a lot of work to do on achieving the holiness that I would like to have! The Buenos Aires Metropolitan Cathedral is where Pope Francis served before becoming our new pope. 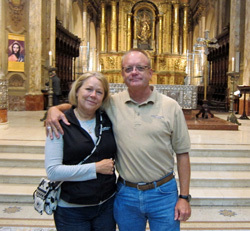 Cindy and I got to visit and attend Mass during a business trip last week for a conference that was held nearby. We learned that the patroness of Argentina is Our Lady of Luján and found a small statute that we brought back. The Cathedral also houses the remains of General José de San Martín, a famous revolutionary leader. I am constantly amazed at the opportunities we’ve had to attend Mass all over the world. This is definitely a highlight because of the connection to Pope Francis. Last Sunday I was returning home from Missouri where I went for business related reasons. 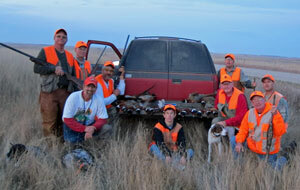 After living in Missouri for about 21 years it was interesting to get back to that familiar territory. 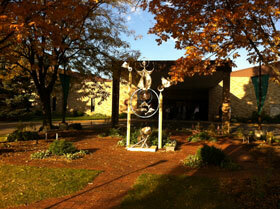 The photo is St. Francis Borgia in Washington, MO. I have mtgs. near there for two days before heading to Columbia, Jefferson City and Camdenton. It has been over a year since moving back to my home state of Florida. I like Missouri but love Florida more. Great to be in the sunshine state although it’s not shining right now. 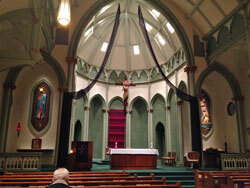 Here are pictures from two more Pensacola churches we’ve visited recently. 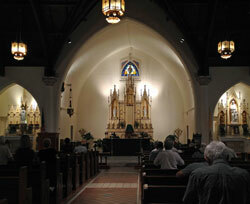 This one is the Cathedral of the Sacred Heart in downtown Pensacola. Downtown is about a 25 minute or so drive depending on traffic. I attended a weekday early morning Mass here last week. I’d like to find the time to visit our Diocesan office and meet our new Bishop! I had thought of asking him for his suggestion of a new spiritual director but he’s so new I wonder if he’s actually met all the priests in our diocese. The pastor at St. Mary’s where we’ve been going to morning Mass most often suggested I meet with his new associate in July. We’ll see . 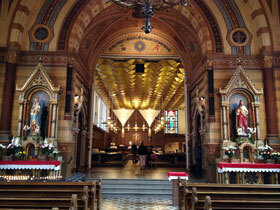 . .
Another downtown church is the Basilica of St. Michael the Archangel. I made it to a noon Mass here and love this church. 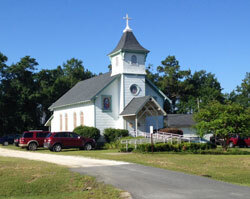 Canonically established in 1781, the parish of St. Michael the Archangel has served the Catholic congregation in Northwest Florida for over 230 years. In recognition of its historic significance, St. Michael Church was inaugurated as a basilica in 2012. It is our Mission to continue to celebrate the word of Christ through service in the historic and traditional warmth of a growing and diverse parish. So this church was just named a Basilica this year! It is a minor basilica and was designated this January. The big move is over. We’re now in Florida and still have a lot of boxes to unpack. We’re also still deciding on a parish to join. 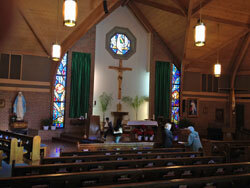 Cindy and I have been attending weekday and Sunday Masses at several nearby churches. 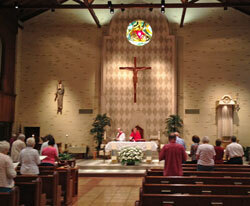 Last Sunday we attended Mass at St. Elizabeth of Hungary in Cantonment, FL. This is a mission church and a very small one “out in the country.” It’s actually not far away at all. We’ve got about 5 churches within reasonable distance to choose from! Besides selecting a parish to join I’m also seeking a new spiritual director. I’m hoping and praying for guidance on this. After seeing Fr. Bill in Missouri for many years I’ve got a feeling this will be a big change but who knows? 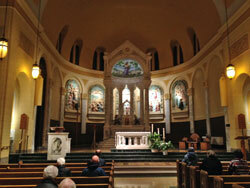 Last week Cindy and I attended Mass at St. Patrick Catholic Church in Urbana, IL. We got to see a college friend who has just started work in the area. It was great to re-connect after about 31 years! It was also nice to travel together again for work and have the time to weekday Mass. Have you ever tried going to a weekday Mass? On a regular basis? Think it’s not possible? I thought so until I started doing it. Made it a priority and now if I can’t go I feel like my day is missing something. Something important. Which it surely is. One of the things I found is that I’m more productive in a day when I make it to Mass. Seems counter intuitive but that’s just the way God works. Cindy and I got to work together last week in Louisville, KY at the National Farm Machinery Show. It’s a huge indoor farm show at the Kentucky Expo Center. 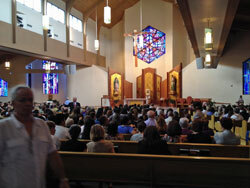 We attended weekday Mass at St. Agnes Catholic Church. This is a beautiful church that we’ve both been to before when we’ve been in town for the show. This was the first time we got to go together. We get to work together again this week at the National Ethanol Conference in Orlando, FL too. Hello from Perdido Key, FL. Our family came down to a beach condo late in December and enjoyed Christmas and New Year’s here. After two of our daughters went back to Missouri, Cindy, daughter Chelsea and I stayed here. We’re going back at the end of the month. Now before you think we’re just laying on the beach, we have a good reason. We’ve been house hunting as we hope to relocate to Florida. In fact, we’ve got an offer in on a house right now and are saying our prayers it will be accepted. While down here we’ve attended Mass at several churches. 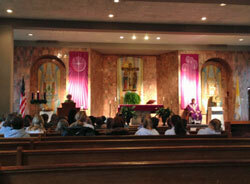 Yesterday morning we attended Mass at St. Mary’s, pictured here. It’s the only church near us that has a Saturday morning Mass. It’s also one of two churches near where we hope to live. Florida is my home state and where Cindy grew up. 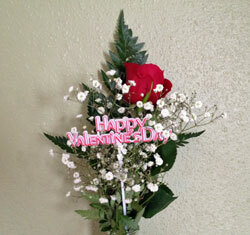 We’ve wanted to make this move for years but waited until our daughters were finished with college. Actually, our middle daughter still has a couple years of grad school in St. Louis to get her doctorate in Physical Therapy. So, our path to holiness may be taking us to Florida soon. I’m thinking positively anyway. 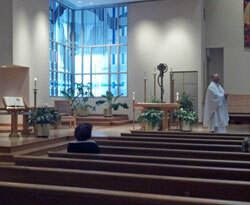 My wife Cindy and I have been attending Mass this week at St. Dennis church in Madison, WI. I wish I could tell you what the sculpture in the picture is but you pass it on the way into the church. The trees are in full fall color so it was a pretty setting. We’re attending the World Dairy Expo which is the largest dairy show in the United States. It’s an annual event and you can find our stories and photos on our dairy news website, World Dairy Diary.